My partner and I spent the day hiking Mt. Waterman and were making the long twisty drive home as it was getting dark out. 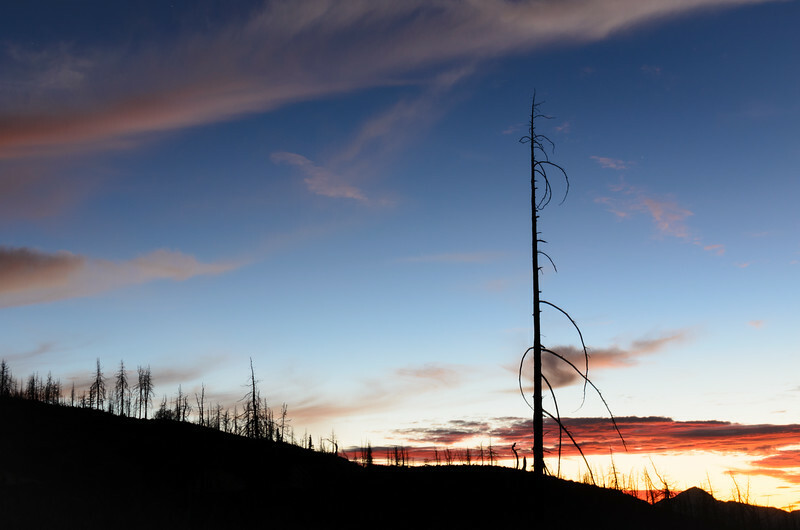 Then two things happened...a gorgeous sunset erupted and we made our way through a section of forest that had been especially scorched by the Station Fire in 2009. Julie could tell I was itching to try a photo, so we found a turnout and as it got dark out I quickly set up the tripod, plopped down on the ground and fired off some shots. I knew the tree at left would be the centerpiece of the shot -- it was such an obvious subject -- and I really wanted to get the silhouette of the burned trees on the ridge in the background. I was using my Nikon D5100 and a Nikon DX 35mm 1.8 lens, which is both my sharpest and fastest lens. As for exposure, I wanted to keep the ISO at 100, as that produces the least amount of digital noise on my Nikon D5100. And I needed some depth of field to keep both the tree in the foreground and the trees in the background relatively sharp. I ended up going with a shutter speed of six seconds at f/7.1. I shot in RAW -- best for fixing mistakes -- and processed in Lightroom, using VSCO slide film presets (Fuji Astia). And it worked. 1. If you're not sure if you should pull over and take a photo, pull over and take a photo. 2. If you're not sure if you're going to need a tripod that day, bring it anyway. It's the best way to get really good shots at dawn and dusk, the best time to shoot. Bird eating fish in the Los Angeles River!